Movies about vacations gone wrong tend to favour plots of travelers clashing with the natives and having to find their way out of whatever mess they dug themselves into but the movies don't often include drug dealers, gang wars and a life-or-death mission. Crossing Point stars Shawn Lock and MarÃ­a Gabriela de FarÃ­a as Michael and Olivia, a couple on vacation in Baja when their idyllic trip is turned upside down when Olivia is taken by a drug dealer. The dealer gives Michael an ultimatum: deliver a backpack full of cocaine into the US in the next 12 hours or Olivia dies. And as if that's not bad enough, the cocaine in question was stolen from a rival cartel who are on the hunt to get back their product. The movie also stars Tom Sizemore, Damon Whitaker and the always awesome Luke Goss. 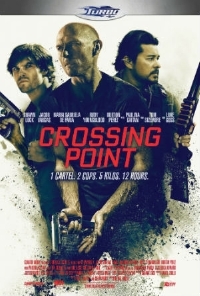 In this exclusive clip from the movie, Michael makes a narrow escape from the rival cartel as the countdown clock shows he has less than an hour to complete his delivery and from the looks of things, he's far from completing his task. Though this is a pretty low budget affair, I'm impressed by the trailer and the clip which suggest the action sequences are solid. Crossing Point is now available on VOD and iTunes.